Hi Everyone! 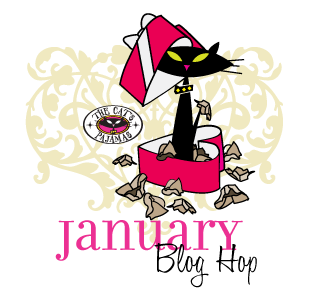 We’re kicking off a new challenge this week and the celebration of our Sneaky Peeks with a Blog Hop today! It’s been a fabulous week of sneak peeks at The Cat’s Pajamas and now all of the sets and dies are available for purchase! You should have come from Brenda’s blog along the hop, or you can start right at the beginning at Deborah’s blog. Either way there’s great stuff in store for you to see! 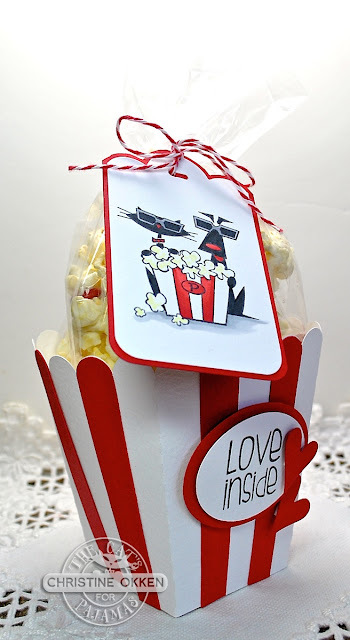 Today I’ve got a fun design to show you today that makes a really cute treat for someone special. 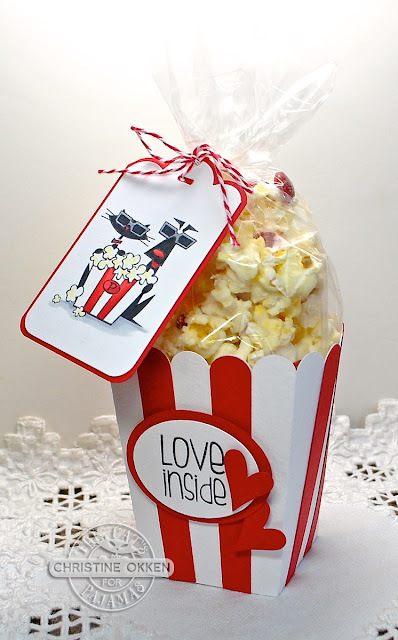 Perfect for Valentine’s or any day you want to show some love. GAH! Who doesn’t love popcorn in a popcorn box! Once I saw this awesome image in the Just Let it Happen Set, I knew I wanted to make a treat bag from a popcorn box. For the tag, I stamped the image from the set onto Neenah white cardstock and then added a wee bit of colour with my Copics. Aren’t their 3D glasses adorable???. I cut out the tag using the Toppers CutUps die and rounded the corners along the bottom. 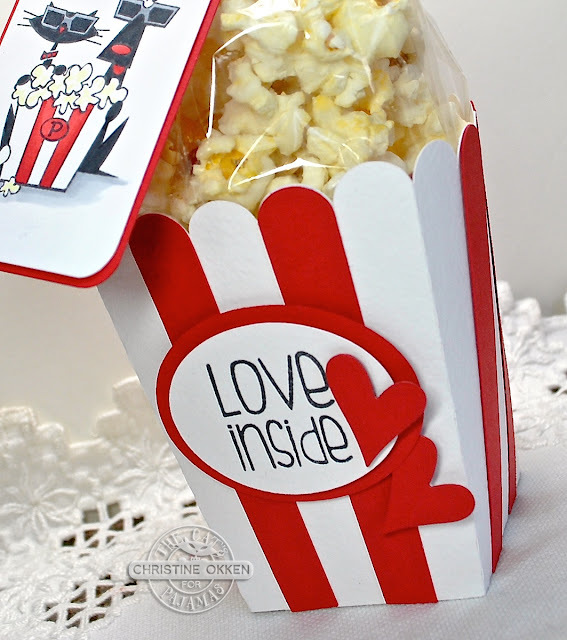 Then I used a popcorn box file from the Silhouette store, (I was so giddy when I found it! ), and then stamped the sentiment on the label and added some hearts from the Small Envie CutUps die. This die has a little different shape for the heart than the Nested Hearts CutUps. 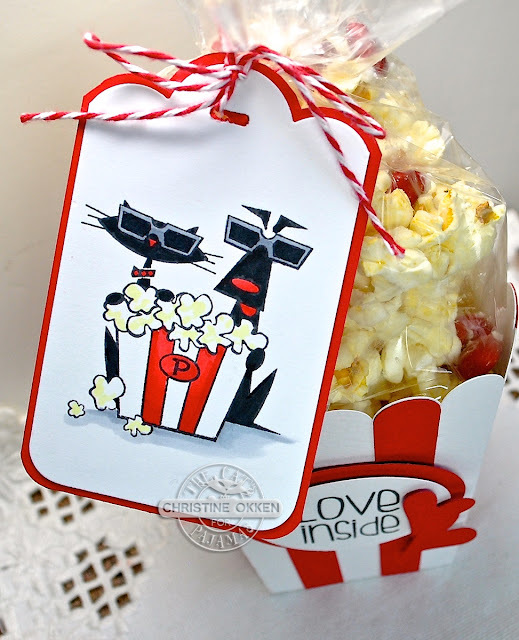 Some simple twine ties the tag onto the treat bag. Inside is white chocolate and M&M popcorn I made, which was yummy. I love how eye-catching the colours are, and it’s such a sweet gift! Now you can head on over to Nancy’s Blog to continue the hippity-hop fun! And be sure to join in with us on the Anything Goes Challenge! OMGoodness, this is just the perfect gift to pair up with that image! That popcorn with white chocolate and M&M's sounds divine! :-) Thanks for all your kind words and warm welcome. I enjoyed joining in with the DT this month! Guess where I'm going later today....this box is perfect! I have loved all your wonderful creations this week. Perfect, perfect!! I love this idea and that cut file is so much fun! Beautiful job. Oh what an original project. I really love this stamp set and you have used it brilliantly. Perfect! Now all you have to do is tuck in a gift card for the movies! Love this! Adorable! Now I feel like eating some popcorn and watching a movie LOL!